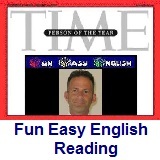 ﻿ Fun Easy English - reading practice and learning about the holiday Mardi Gras. The terms "Mardi Gras" and "Mardi Gras season", in English, refer to events of the Carnival celebrations, ending on the day before Ash Wednesday. Hi. In the classroom today you will learn about Mardi Gras. From the French term "Mardi Gras", the term has come to mean the whole period of activity related to those events, beyond just the single day, often called Mardi Gras Day or Fat Tuesday. The season can be designated by the year, as in "Mardi Gras 2008". The time period varies from city to city. Cities most famous for their Mardi Gras celebrations include Rio de Janeiro, Brazil, and New Orleans, Louisiana in the United States. Many other places have important Mardi Gras celebrations as well. Mardi Gras in New Orleans, Louisiana is one of the most famous Carnival celebrations in the world. The season of parades, balls, and king cake parties begins on that date. From about two weeks before, through Fat Tuesday, there is at least one major parade each day. The largest and most elaborate parades take place the last five days of the season. In the final week of Carnival many events large and small occur throughout New Orleans and surrounding communities. While many tourists center their Mardi Gras season activities on Bourbon Street and the French Quarter, none of the major Mardi Gras parades have entered the Quarter since 1972 because of its narrow streets and overhead obstructions. Instead, major parades originate in the Uptown and Mid-City districts and follow a route along St. Charles Avenue and Canal Street, on the upriver side of the French Quarter. Mardi Gras is considered to be one of the craziest celebrations in the United States. I actually went to New Orleans for a few weeks when I was a teenager. I did not get the chance to see Mardi Gras but I was able to spend many night in the French Quarter listening to incredible jazz and getting very drunk from a drink called a hurricane. lol. 1. Mardi Gras refers to which of the following? 2. The term Mardi Gras comes from which language? 3. Rio de Janeiro is a large city in which country? 4. New Orleans is a large city in which country? 5. Why are few parades held in the French Quarter?